President Michael D Higgins has strongly criticised the rise of precarious work and bogus self-employment and said the battle for decent work will be one of the defining struggles of the coming decades. He told the Fórsa conference in Killarney that some recent developments in the world of employment were nothing less than a return to some of the worst practices of the 19th century. He said one of the great victories of the trade union movement had been the regulation of piece work, but he warned that such practices must not be allowed to re-emerge "under the cloak of supposed innovation". He cited a recent Irish Congress of Trade Unions report, which revealed that the proportion of the workforce on temporary short-term contracts had been growing since 2008, and that 160,000 people endured significant variations in their hours of work from week to week, or month to month. He said this was creating a new category of worker – ‘the precariat’ - whose social and economic rights were more restricted than those they work alongside. He added that in a context of rising rents, this chronic job insecurity can be a source of deep anxiety to so many of our citizens. President Higgins told delegates that while technology had brought greater freedom and flexibility into people's lives, it had also been used to blur the line between an employee's work and home life. He criticised what he called the "increased and unspoken assumption" that employees would stretch their working day far beyond their contracted and paid hours. He said employees were increasingly expected to shape their lives, and those of the families, around the demands and economic interests of the workplace, adding: "A pin-ball machine is hardly a suitable substitute for workers' rights." In a reference to the so-called gig economy, he said co-ordination and direction of employees by an algorithm owned by a company does not divest the employer of their responsibility any less than a bogus self-employment does. The President praised the role of trade unions but acknowledged many feared that they had been losing ground for many years. He noted that in 1980, 62% of workers were unionised, while today that has fallen to around one in four, with more than half of them in the public sector. He blamed the rise of individualism as a source of values, along with an ill-informed hostility to the State and its institutions. 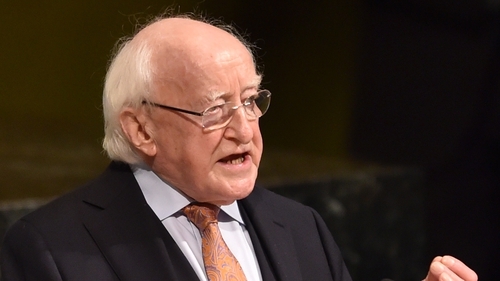 President Higgins noted an international trend for less of the world's income to go to workers. He said the three big challenges that lay ahead were climate change, welcoming and managing migration, and ensuring sustainable development. He also called for trade union solidarity to be extended beyond workers to all who are excluded. Fórsa was formed earlier this year following an amalgamation of IMPACT, the Civil Public and Services Union, and the Public Service Executive Union. It is now the second largest union in the State with 80,000 members.